On Wednesday November 21st Kandice was given a "Life Flight" from Billings, MT to Denver, CO due to an 80mm tumor that was found in her brain. Temporary relocation to Denver, CO for about a year is the family's only real option as it gives their beautiful little girl her best chance. The mass was identified as an AT/RT tumor and she was started on aggressive chemotherapy in preparation for a stem cell transplant. The family was able to spend time together in their new Denver apartment over the Thanksgiving holiday. December 2nd Kandi was admitted again for 1 1/2 weeks for a round of chemo and recovery and then another round a few weeks later. These will be highly intensive and come with some serious risks that will take a big toll of her and her family. 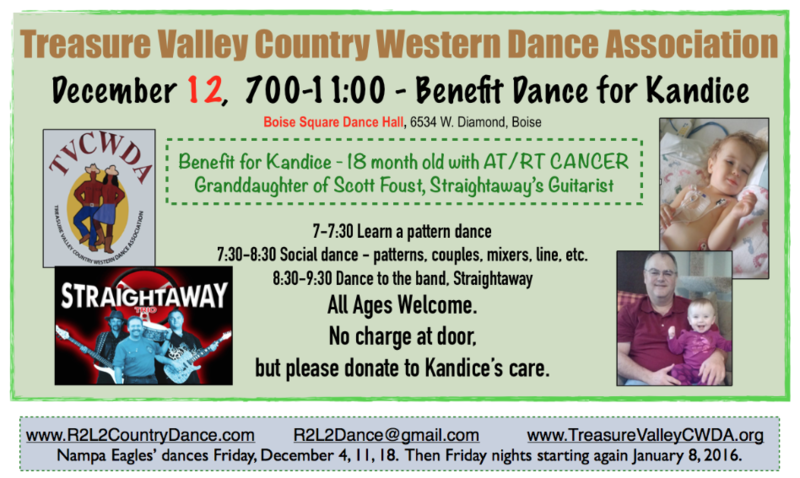 Please come to the TVCWDA dance December 12th and donate to Kandice's care. Please make a donation to help Kandice!!!!! !